UPDATE (1 Sep, 11:24 am): Missing 14-year-old Kristy-Leigh Wetton has been located safe and well. ACT Policing would like to thank the community for their assistance. 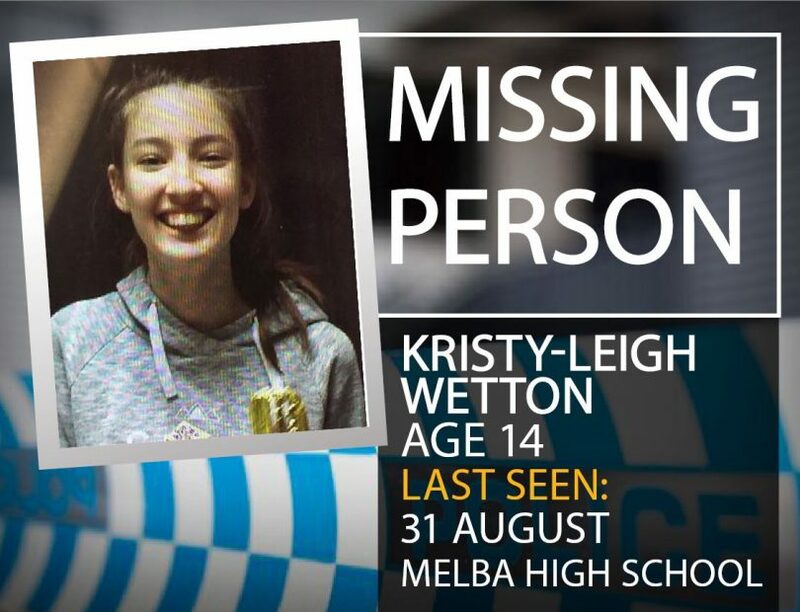 Police are asking the public for help in locating a missing 14-year-old girl named Kristy-Leigh Wetton who was last seen leaving Melba High School at 3.30 pm yesterday. Police say they are seeking to locate Kristy-Leigh in order to confirm her welfare and to reassure her that she is not in trouble. Kristy-Leigh is about 170 centimetres tall and is described as being Caucasian in appearance, with a slim build, light brown shoulder-length hair and brown eyes. When she was last seen yesterday afternoon at Melba High School on Conley Drive, Melba, she was planning to walk to Charnwood. At the time, she was wearing a grey Melba High School jacket with black stripes on the sleeves, grey Melba High School tracksuit pants, white shoes and carrying a black and yellow backpack. ACT Policing is asking anyone who has seen Kristy-Leigh or has any information about her whereabouts to please call police immediately on 131-444.